CITES currently permits trade in live, wild-sourced African elephants. Appendix II elephants from Botswana and Zimbabwe can be traded to “appropriate and acceptable destinations”, and from Namibia and South Africa to “in situ conservation programs” (Resolution Conf. 11.20 (Rev. CoP17)), while elephants from wild Appendix I populations can be traded for non-commercial purposes to destinations “suitably equipped to house and care for” them (CITES Article III par. 3(b)). Although such trade is legal under CITES, concern has been expressed over its impact on the animals involved and on those remaining in the wild. The African Elephant Specialist Group of the IUCN Species Survival Commission has stated that it “does not endorse the removal of African elephants from the wild for any captive use”, believing there to be “no direct benefit for [their]in situ conservation”. At CITES CoP17 (2016), seven African elephant range States recommended that, except in emergencies, only “in situ conservation programmes or secure areas in the wild within the species’ natural range” should be regarded as “appropriate and acceptable” or “suitably equipped” under the Convention. Their recommendation, along with a proposal submitted by the USA on live animal trade, resulted in the amendment of Resolution Conf. 11.20 to include a new requirement that, to be “appropriate and acceptable” trade in live animals must promote in situ conservation. This paper provides information on the physical and behavioural characteristics of African elephants and the recent history of the live elephant trade. It further suggests that zoos, as they currently exist, are not suitably equipped to house and care for, and should not be consideredappropriate and acceptable destinations for, live, wild-sourced African elephants. Between 1990 and 2015, 1,774 live, wild-sourced African elephants were exported internationally, mostly to non-range States. Exports from all countries were mainly for circuses and traveling exhibitions (583), reintroduction into natural range (497), and zoos (331). From range States alone, 366 wild-caught elephants were reportedly exported to zoos and circuses. There were 116 live elephants listed as having been exported during this period with no listed purpose code. The top countries exporting from the wild were South Africa, Namibia, and Zimbabwe for zoos (63%), and South Africa, Namibia and Botswana for circuses (9%). Top importers were China (29%), the USA (29%) and Mexico (22 %) for zoos and Denmark, Germany, Sweden, Poland, Italy, Norway, and Monaco (55%) for circuses. Trade for circuses has declined markedly in recent years. An estimated 533 wild-sourced African elephants are currently held in captivity, 465 in zoos and 68 in circuses. African elephants are found in zoos in Europe (121, particularly in Germany, Spain, United Kingdom and France) North America (142, with 139 in the US alone) and Asia (139, with 80 in China and 45 in Japan). Others are in Latin America (22 in Mexico), Maghreb countries and South Africa. Most African elephants in circuses are in Europe (48, 22 of which are in Germany). Only 16 wild-caught African elephants apparently remain in US circuses. African elephants are wide-ranging, intelligent animals with complex social structures underpinned by strong family bonds. Social interactions are essential to well-being of both sexes, both during early life and as adults. Wild African elephants are constantly on the move, keeping their minds stimulated and their bodies physically fit. Failure to provide for their specific needs deprives captive elephants of crucial learning skills and affects their health. Until the mid-1990s, most captures of young African elephants were the by-product of culling operations. More recently, captures have involved separating calves from their family groups. This causes significant physical, behavioural, and psychological trauma, and potentially results in injuries or mortality of the calves or their family members. South Africa has now prohibited the capture of live, wild elephants for export under its National Norms and Standards for the Management of Elephants in South Africa (2008). Captured calves transported to holding facilities suffer depression, lethargy, anxiety, increased stress, intra-specific aggression, and a diminished or non-existent appetite, sometimes resulting in death or contributing to premature mortality. Training in temporary facilities may include food and/or light deprivation, restriction of movement, forcing the animal into an uncomfortable position for extended periods of time, and regular beatings. Median lifespan of zoo-born African elephants is 17 years, compared with 56 years in a wellstudied wild population. Mortality in the first two years is over 30% for captive-born animals, compared to 4-25% in wild populations. An estimated 54% of captive-born African elephant calves in the US die while still juveniles. For most zoo elephants, few social or kin companions are available for interaction. Only one of eight facilities in the UK has a typical age and kin structured group. In the US, reported mean group size for African elephants is some 4.5 animals. Some 61% of 33 accredited zoos in the US with African elephants have four or fewer animals, and most (16 of 20) hold three or fewer. Only 26% of sexually mature female African elephants in the USA in 2012 had ever calved, and less than half were cycling normally. EU collections show high levels of stillbirth or obstructed birth and inadequate maternal care (34% of 67 births). Among US females, average age at first birth was over 21 years, compared to 9-11 years in the wild. The average outdoor space experienced by individual elephants in North American zoos is under 4,000m2; indoor areas average 129 m2. Existing captive facilities cannot provide the space needed (estimated at ~2 km2 /individual) for wild-caught African elephants to exhibit natural behaviours or sustain physical fitness. Inadequate space and enclosure diversity can result in foot and joint disease and psychological frustration. Obesity, foot health, arthritis, and tooth abnormalities are common health concerns for captive African elephants. Lack of movement, inappropriate substrates and limited opportunity for exercise result in weak, ill and unfit elephants with compromised welfare, poor reproductive ability, and reduced longevity among calves. 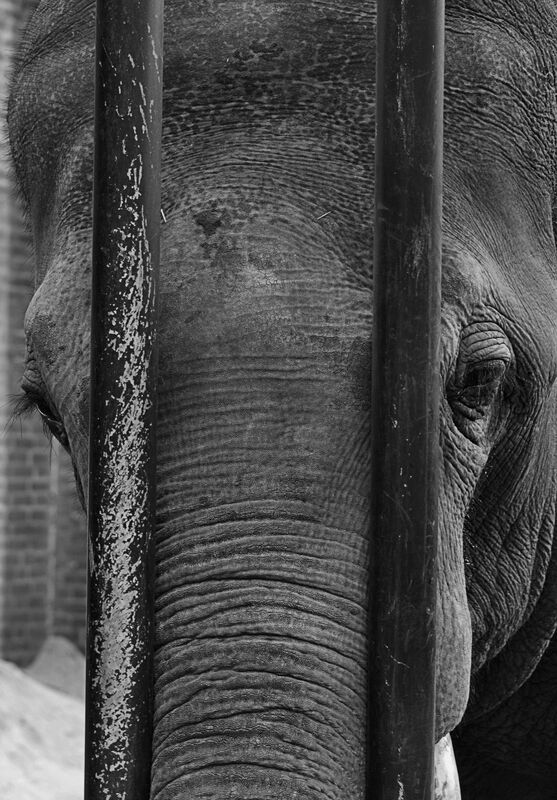 Few countries have guidelines for captive elephant welfare in zoos. Those that exist are generally non-binding except for accreditation by zoo organizations in some countries. Existing guidelines focus on health status, with space recommendations that fall short of what elephant biology requires. A recent review of UK guidelines called for urgent attention to space requirements, natural choice of companions, and a shift to a positive reward system. There are fewer mandated welfare requirements for non-zoo facilities, including circuses and elephant tourism camps. 25, 2016, were intended for Beijing and Shanghai Wild Animal Parks; one animal died during transit from an overdose of tranquilizer. these elephants were aged between two and four; a number displayed stress-induced behaviours. A total of 17 elephants were exported from Swaziland to three US zoos in March 2016. One juvenile died prior to transfer. The group included a pregnant female, a violation of IATA transport guidelines. A further juvenile male died under anesthesia in September 2017. A transfer of five elephant calves from Namibia to the United Arab Emirates has apparently been put on hold. should be no trade in live wild-caught African elephants for captive use.